If you grew up in a home with a big backyard, you probably have fond memories of hanging out with your friends and playing games after school and on the weekends. Then when school was finally over for the year and you had the whole summer to enjoy, that backyard became the center of your universe running through the sprinklers or swimming in your own pool. When the holidays rolled around, the entire family was able to gather in that huge backyard to enjoy barbecues, games and other festivities. Now that you are all grown up and have a home of your own, you want to recreate that backyard experience for your own kids. Unfortunately, your own backyard is not quite as spacious as the one you remember from your youth. In fact, some would go so far as to say your outdoor living space is downright cramped. So what do you do? Moving is not an option and neither is invading your neighbor’s land in search of more outdoor space. If you want to give your kids the same outdoor experience you enjoyed as a child, you will need to make the most of the space you do have. You do not have to let a lack of space interfere with your summer fun or stop you from making great memories with your own kids. Creating a targeted play area allows you to make the most of the space you have available, and there are plenty of things you can do to make your small backyard more fun. If your cramped quarters do not provide room for a full-size pool, set up a small splash pool for the kids to enjoy. Create your own wet and wild summer fun with a sprinkler you can attach to a garden hose. You can even set up a T-ball practice area for the young ones to enjoy. Setting up a small tent or canopy can serve as a fort or secret space. I remember creating a hidden fort in the space between some bushes and the fence. A swing or hammock can also be used to add activities to your small space. 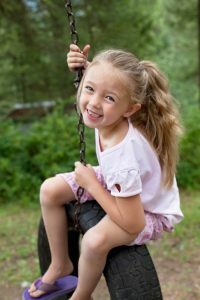 Even if there is not enough room for a traditional swing, you can easily hang a climbing rope for older children to use. There are plenty of ways to optimize your small backyard and create a play area your kids will love. 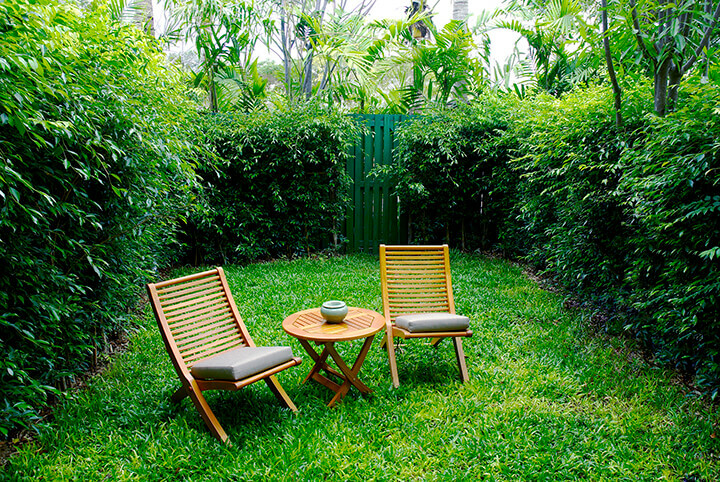 Letting clutter accumulate in your small backyard will only make it look smaller and more cramped. Set up a strict no-clutter zone outside your home along with a dedicated spot inside the house or garage for sports gear, shoes and other things that would otherwise clutter up your yard. Be sure to pick any clutter that does accumulate outside your home, and encourage the kids to do the same. You will be surprised at the difference decluttering your yard can make. Adding a storage bench like the one below (check price on Amazon) can optimize your available space and keep the things you use all the time within easy reach. This image links to Amazon. Whether you use your storage bench to stow your gardening gloves or stash the kids’ sports equipment, this is one addition that will help you make the most of your small backyard. If you grew up with a big backyard, you may have happy memories of gardening with your parents and watching the beauty of nature unfold over the course of the summer. You may not have room for a full-size flower or vegetable garden in your small backyard, but that does not mean you cannot recreate this special memory with your kids. Container gardening is a great alternative to a traditional garden, and there are many different crops that do quite well in cramped spaces. Whether you grow a garden full of red ripe tomatoes on the patio or an abundance of colorful flowers on the deck, container gardening is a great way to relive the days of your youth and teach the kids about nature in all its forms. 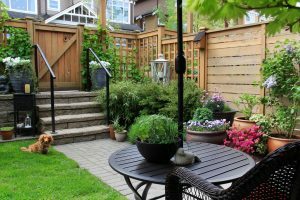 Nothing can make your tiny backyard a huge outdoor living space, but there are plenty of things you can do to make the most of the room you have available. The tips listed above can help you optimize your outdoor living space and make new memories with your own family.